Whenever we eat a heavy lunch during Festivals, in the evening, best meal is Khichdi, which is light on the stomach and easy to digest. It is yummy in taste also. 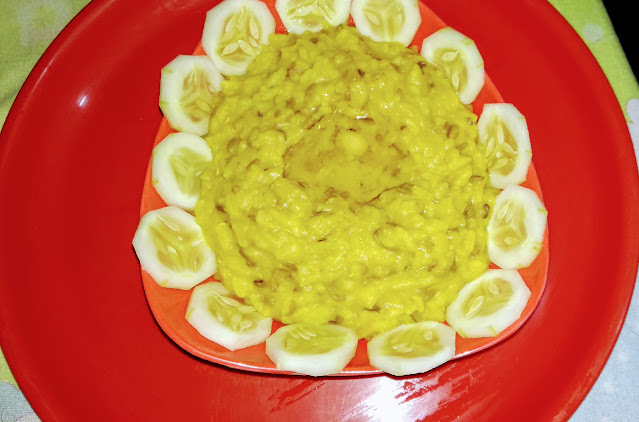 Some people like simple Khichdi, while some like Masala vegetable Khichdi. The most important ingredient in Khichdi is ghee. All the taste of Khichdi comes from ghee. Use cow ghee which is good for health. 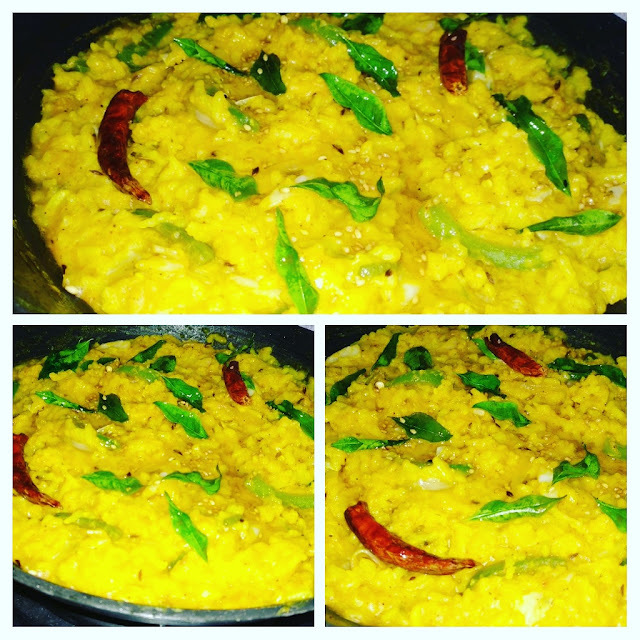 Khichdi is made from Moong Dal and Parmal rice, Gujarati people make Khichdi with pigeon Dal. Today, sharing Masala Khichdi in my style and also recipe of plain Khichdi for beginners. Take 1/2 cup moong Dal and 1/2 cup Parmal rice in a cooker and wash them. Add 3 cups water, salt to taste and 1/2 tea spoon turmeric powder. Pressure cook it for 2-3 whistles. Heat 1 tbsp refined oil in a non-stick pan. Add ginger, garlic, green chili paste, saute for 2 minutes. Add capsicum and cabbage and saute for 2-3 minutes. Add red chili powder, Garam Masala and little salt to taste. Mix well. Add the cooked Khichdi and mix well. Heat 1 tbsp ghee in a Tadka pan. Add cumin seeds, when they crackle, turn off the gas. 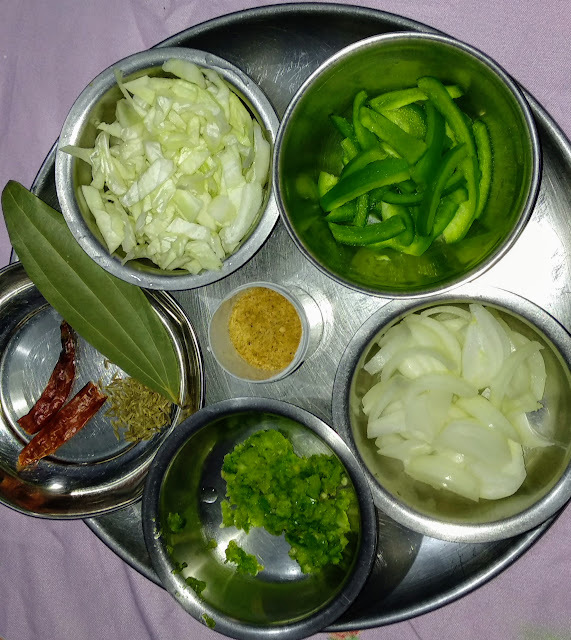 Add sesame seeds, Asafoetida, dry red chili and curry leaves and pour the Tadka on prepared Khichdi. 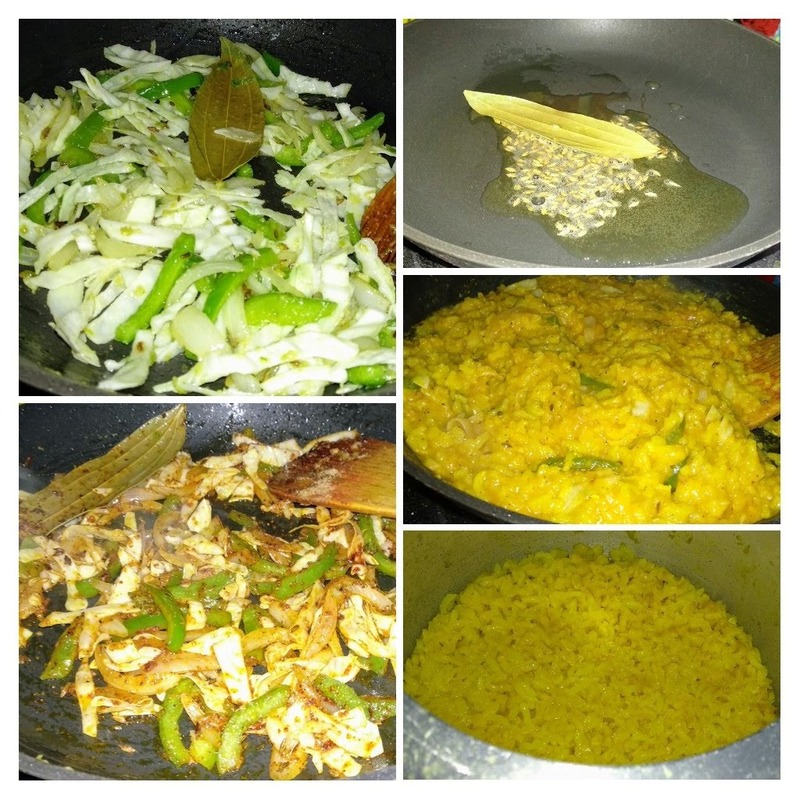 Tasty and healthy Masala vegetable Khichdi is ready. Serve hot with curd or it tastes great without anything. For plain Khichdi, just take Green Moong Dal and Parmal rice in equal quantity in a pressure cooker. Wash them and add 3 cups water, salt to taste and 1/2 teaspoon turmeric powder. Add some more water and cook if you like little semi-liquid consistency. Add 2 teaspoons cow ghee and serve hot.